The release date for the official Iron Man 3 game is right around the corner. The game launches next week on April 25. To whet our appetite, Gameloft has been teasing us with some teaser trailers of the game. 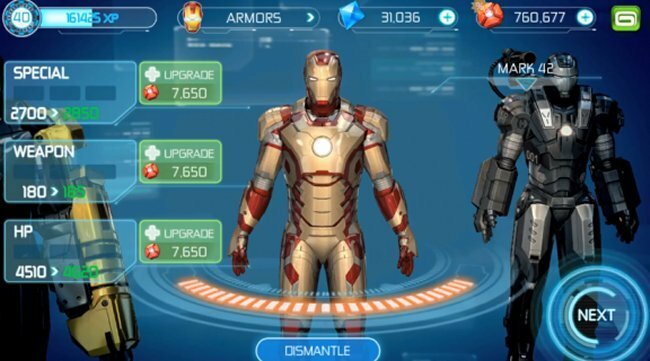 Today they released another one that shows off some of the Iron Man suits and other in-app purchases. We get a short glimpse of what to expect with in-app purchases, as well as very brief look into some new gameplay that we didn’t see with last month’s gameplay trailer. You can get the Iron Man suits in different colors, and some of the more high-end ones even come with machine guns. Nice! You can spend money to upgrade your armor and weapon power, as well as your HP, which calculates how much damage you put on your enemies with your weapons and moves. There are 18 suits in all. Who is looking forward to this one?